Harlequin quad-pinstripe. Congrats! Have fun with your new family member! Awesome, it's gorgeous! Happy gecko! If you use a handwarmer, wrap it inside an old sock so that your gecko does sit directly on it. For greenery, you can some nice stuff very inexpensively at thrift stores. Just rinse well in hot water before putting in your tank. Active senior lady, married with kids and grandkids, love my pets! Have had reptiles over the years, just got back into the hobby. 09:13 PM - Sg612 quoted GeckoLeen in post Zoo Meds Eco Earth a good substrate? 06:35 PM - Abigail1997 quoted GeckoLeen in post Introduction! 07:05 PM - Elliriyanna quoted GeckoLeen in post Enclosure feedback? 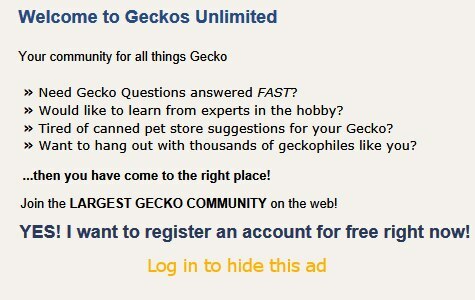 09:46 PM - JoshMason17 quoted GeckoLeen in post Updated Gold Dust Day Gecko Terrarium!